With summer holidays fast approaching (or perhaps your kids are already enjoying the summer break), it’s time to start planning some fun activities to help entertain the kids. 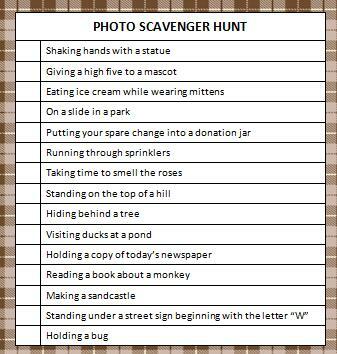 A photo scavenger hunt is a great way to spend the day having fun and making memories! You’ll want to grab a camera and take the kids out on an adventure around the city (or even just to a mall or park) to complete this fun photo scavenger hunt. Chances are that you won’t be able to find all of these items in one location so you may need to drive to a few different locations. Create a fun list of items for your kids to find (the stranger & funnier the better) and have them take pictures of themselves completing the photo scavenger hunt list. You could also print this one for free. You can then drop off your pictures to be developed while you enjoy lunch with your kids in the food court or at the park. Once you receive your pictures, you can use the them to create a few fun pages for your family scrapbook. Which item on this list do you think would be the most difficult to find? Which would be the most fun to complete? For more fun ideas and freebies, follow us on Facebook, Twitter, Pinterest and Bloglovin’. *Digital paper by Pixel Paper Prints. I love your scavenger hunt ideas! These make great low cost summer activities. I am saving a few to my computer so we can print them! So sweet of you to say – thanks for stopping by! Sounds like a great idea. Could be a way to come up with activities for the whole summer by doing a couple a week instead of just in one day. Just found your site today and I am beyond grateful for sharing all of your ideas. You will be changing our family’s lives for the better!!! Gone are the days we play the same old games again and again! All of your ideas are awesome and I really want to thank you so much! You are too kind – thank you so much!